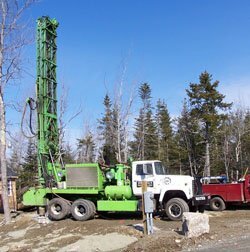 Owners Warren Haskell and Russell Cookingham are both State of Maine-licensed Master Well Drillers and Master Pump Installers with many years of experience. We also offer troubleshooting and repairs for water wells and pumping systems. 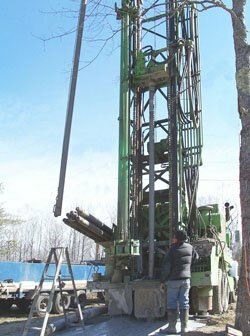 If you are considering a geothermal project, we can drill those wells too! Just click on the quote link below and let us know about your needs. 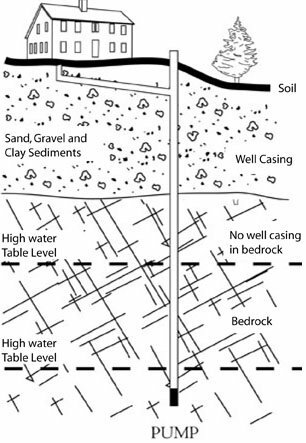 Basic well construction involves several steps. First, the well needs to be located in a relatively flat area where we can set up our 30-ton drilling rig. 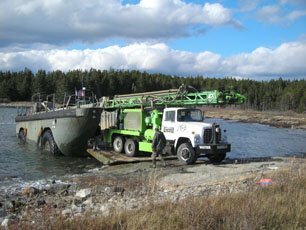 The machine is hydraulically jacked up and leveled, then a 35-foot mast is erected. We begin drilling an 8-inch hole with a Tri-cone roller bit through the unconsolidated overburden (topsoil, clay, gravel, and sand) until we have reached bedrock. The 8-inch drill is then removed from the hole, and the hole is cased with 6″ – 17 lb/ft. steel pipe. The terminal end of the casing has a hardened steel drive shoe which allows us to nail and seal the casing into the ledge in such a manner that surface water cannot enter the well, possibly contaminating the well. Well casing lengths are 20 ft. and are threaded and coupled at both ends. The length of casing needed varies depending on the depth of overburden. Once the casing is set into the bedrock (ledge), we lower our 6″ pneumatic hammer with a 6″ carbide button bit inside the casing. The air driver hammer is designed to drill to solid bedrock. From here on, the rock provides the structure of the well. What we are looking for is fractures in the rock that will hold sufficient amounts of water for a family. The air from our compressor allows the hammer to operate and air lift the rock material that we are drilling up and out of the top of the bore hole. Any water that is found is also expelled this way. The minimum amount of water needed depends on the overall depth of the well. Normally, a well will fill up to within 30 feet of the top of the well. This is called the hydrostatic or static level. Occasionally, a well will overflow. A 160-foot deep well will have a reservoir of 240 gallons when completely full (1½ gallons per foot for a 6″ well), and should have a minimum flow rate of 3 gallons per minute. Minimum flow rates will vary depending on the overall depth and static level of the well. Most wells can be completed in a single day. Depths vary greatly, but the average seems to be around 200 feet. Rarely will the well depth run over 300 feet. Once the well is completed, a pumping system will need to be sized and installed. We are Maine-licensed Master Pump Installers and licensed electricians. We can arrange to have a backhoe dig a trench from the well to the house. The submersible pump is installed down into the well, and a pressure tank and pump control are located inside the home. The very best materials available are used in all pumping systems we install. In the case of older homes, we will be glad to plumb and wire the pressure tank into your existing plumbing and wire the pump to your load center with the proper size wire and circuit breakers. 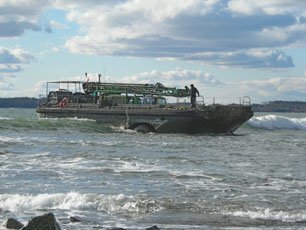 Water treatment equipment is also available to remove iron and sulphur (which are found naturally in many coastal Maine areas) from the water. We would be glad to visit your property and help you decide on the best location for your new well, this service is free. Midcoast, Central Maine, Lincoln County, Knox County and surrounding areas.